The present article discusses the phenomenon of lucrative illegality. 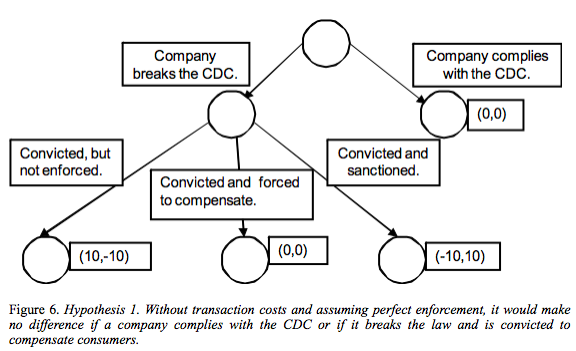 Because private companies make rational decisions on whether to violate consumer protection laws and empirical observation shows that Brazilian companies continue to break the Consumers Defence Code (CDC), I argue that the collective litigation system fails to prevent these wrongdoings due to a lack of effective economic sanctions. Analysing all 405 class actions filed against private companies by the Attorney General Office’s Consumer Protection Department in Rio de Janeiro between 1991 and 2010, I demonstrate that the sanctions imposed by judges have not been sufficient to prevent new delinquencies. Brazilian courts should not only convict these companies for their consumer rights violations, but also impose economic sanctions and oblige them to reimburse effectively the illegal fees that they abusively charged. Punitive damages ought to be optimal, deterring companies without causing excessive costs that could harm shareholders and consumers. Illegality should not be lucrative. In the current scenario of under-deterrence, financial institutions, telecommunication companies and other private firms will continue to break the law, once they have economic incentives to do so. Looking at the national rankings of consumer complaints in Brazil, one tends to find a familiar set of ‘usual suspects’: financial institutions and telecommunications companies. These same companies are frequently defendants in class actions throughout the country. Their wrongdoings are regularly broadcasted in the media and yet these companies continue to break Brazilian law. The main goal of the present article is to discuss the possible interdisciplinary explanations of this phenomenon, which I term ‘lucrative illegality’. In plain words, Brazilian companies repeatedly break the law because they are economically encouraged to do so. Consumer collective actions are not effective in punishing wrongdoers, given the reluctance of judges to impose effective economic sanctions. Brazilian legal culture rejects the American concept of punitive damages and companies consequently have clear economic incentives to break the law. The article begins with an explanation of the concept of ‘collective moral damage’ in Brazilian law as the point of departure for a socio-legal analysis of under-deterrence in the consumer collective actions system. First, I will discuss the concept of ‘collective moral damage’, a key legal term in Brazilian collective actions legislation. According to most commentators, courts should convict companies to pay ‘collective moral damages’ as a way to punish them for their wrongdoings and to prevent future delinquencies. Unsurprisingly, ‘collective moral damages’ clauses are widely perceived by academics as the legal basis for judicial decisions that can impose punitive damages to companies. However, judicial precedents of the 1st chamber of the Superior Tribunal of Justice (hereinafter, STJ) do not admit punitive damages in class actions. Their dogmatic justification implies that mass consumer violations do not cause moral harm to society as such (nor to classes or categories of citizens) and, therefore, consumer masses have no right to secure ‘collective moral damages’ with a pedagogical and punitive character. In addition, the court has also expressed its concern with the economic risks and unpredictability of punitive damages. On the other hand, the 2nd chamber of the STJ does admit punitive damages in class actions. In this paper, I will advance the argument that the latter opinion should prevail over the former one, given the negative consequences of denying courts the ability to impose punitive damages in collective litigation. Second, I will examine a statistically significant sample of consumer class action cases at the Attorney General’s Office of Rio de Janeiro. Empirical observation reveals that Brazilian companies constantly break the law. In other words, the fact that a private company is held liable by Brazilian justice does not seem to deter its agents from violating the Consumer’s Defense Code (hereinafter, CDC) and from harming large numbers of consumers. After considering all the class actions cases against private companies, I argue that the convictions of these defendants did not produce effective incentives for compliance with the law. Many companies were convicted during this period and, due to the fact that they did not receive proper economic sanctions, they committed further wrongdoings and became defendants in other consumer class actions. This article is based on empirical observation of the 405 consumer protection class actions filed by public prosecutors in Rio between 1991 and 2010. Mapping companies that continue to break the law and analysing 160 sentences, their economic impact and deterrence effect is assessed. In addition, nine legal actors involved with consumers’ protection class actions were interviewed and provided their opinions on punitive damages and the phenomenon of lucrative illegality. A subsequent section presents one real case study that demonstrates how massive consumer rights violations may be lucrative. In conclusion, I claim that effective economic sanctions are necessary to prevent the phenomenon of lucrative illegality. There is no Brazilian law that clearly admits punitive damages or that sets standards for its application by the judiciary. In 2002, federal representatives tried to include in the Civil Code (CC) an express mandate for judges to impose punitive damages, but this legislative project was never submitted to congressional vote. Nonetheless, Brazilian law has developed a concept of ‘collective moral damages’, which is the legal basis for the application of punitive damages due to the harm caused to society as a whole as a result of massive wrongdoings. According to article 6, VI, of the Brazilian CDC, one of the basic rights of consumers is “the effective prevention and compensation of patrimonial and moral damages, individual, collective, and diffuse”. In addition, Brazilian Civic Public Action Law (LACP) also refers to the moral damage liability in class actions, recognizing the existence of moral harm as a result of environmental pollution, mass consumer violations, urban disorder, cultural or historical heritage destruction, or of anti-economic practices. Since Professor Zavascki was also a justice of the 1st chamber of the STJ, his opinion echoed from the bench. Coherent with his academic writing, Justice Zavascki has expressed the same opinion in his judgements at the 1st chamber of the STJ. Writing the majority opinion, Justice Zavascki stated that moral damages require individual pain and psychological suffering and that collective moral damages may not be imposed as a result of harm caused to society as such. According to Justice Zavascki, environmental protection does not require conviction in order for the responsible party to pay moral damages, since the judicial order to recompose the degraded ecosystem is sufficient to protect nature. Contrasting with these precedents from the 1st chamber, the 2nd chamber of the STJ not only admitted it, but also praised the concept of collective moral damages as a relevant instrument to prevent massive illegalities. In an initial decision, justice Calmon vehemently disagreed with the line of thought of the 1st circuit: “I do not accept the conclusion of the 1st circuit, since evidence of pain, sorrow or psychological harm is inessential to characterize extra-patrimonial damage.” In a very strong opinion of a unanimous court, Justice Calmon added that “massive rights violations may not rest unrepaired”, since it would “lead to the failure of Law to prevent and compensate the social conflicts.” In a subsequent case, Justice Martins wrote the opinion for a unanimous court and upheld a conviction of R$ 120,000 (equivalent to about US$ 60,000) due to collective moral damages. The contrasting precedents within the STJ highlight the importance of the present research. Are extra-patrimonial damages in collective litigation necessary for the effective prevention of massive consumer rights violations? Empirical observation of consumer protection class actions demonstrates that the absence of effective economic sanctions creates a scenario of imperfect enforcement and induces lucrative illegality. The next section will advance this argument through quantitative data gleaned from Brazilian courts. The CDC was enacted in 1990 and came into force by March, 1991. Title III of the Code regulates consumer collective actions, and its rules vary considerably from the American model of collective litigation. First, individuals may not be plaintiffs in a Brazilian consumer collective action. Due to policy reasons, the role of plaintiff in collective actions is performed by public prosecutors, public defenders, private associations, unions, and even by state attorneys. Second, there are no class certification procedures or analyses of adequate representation in Brazil, since these plaintiffs are entitled by the CDC to act on behalf of a mass of consumers. Third, plaintiffs are exempt of all legal fees, including court litigation fees and attorney’s fees. In turn, frivolous litigation and bad faith litigation shall result in a fine that corresponds to ten times the value of the legal fees. Fourth, evidence rules do not include discovery, but may involve the reversal of the burden of proof in favour of plaintiffs. Moreover, public prosecutors may initiate civil investigations to collect documents, hear witness, and produce the necessary evidence to support their class action claims. Few consumer protection collective actions were filed immediately after the enactment of the CDC. For instance, in the city of Rio de Janeiro, public prosecutors filed only 24 consumer protection collective actions against private companies from 1991 until 2001. There are many reasons for the limited number of collective actions during this first decade: lack of consolidated doctrine about the new legislation; lack of structure to conduct investigations and collect evidence of wrongdoings; lack of independence of public prosecutors, since they were subordinated to the Attorney General and had to follow his instructions; lack of expertise to conduct civil investigations, since the senior prosecutors’ professional background had essentially been in criminal law enforcement. The Attorney General Office of Rio de Janeiro restructured its consumer protection department in 2001, appointing four independent prosecutors, whose investigations, deals, and litigation activities were not under the direct control of the Attorney General. Independence enhanced productivity, as it was no longer necessary to seek hierarchical approval or to worry about the political consequences of suing private companies. In addition, the necessary structure to conduct civil investigations was finally provided and more detailed evidence was collected to support collective actions. The appointment of four independent prosecutors for permanent positions also brought technical expertise since their growing experience and credence gradually improved the quality of their work and the quantity of collective actions filed. As a consequence, the consumer protection prosecutors filed 160 consumer collective actions against private companies within the following five years. These cases provide an excellent sample to evaluate the effectiveness of the Brazilian system of collective litigation. Empirical observation of these consumer protection collective actions shows that these private companies are often convicted, but do not receive appropriate economic sanctions for their wrongdoings. Moreover, the excessive time length of trials undermines the effectiveness of their punishments. Therefore, private companies do not have economic incentives to comply with the law. As a result, they commit further wrongdoings and more consumer collective action suits need to be filed against them. 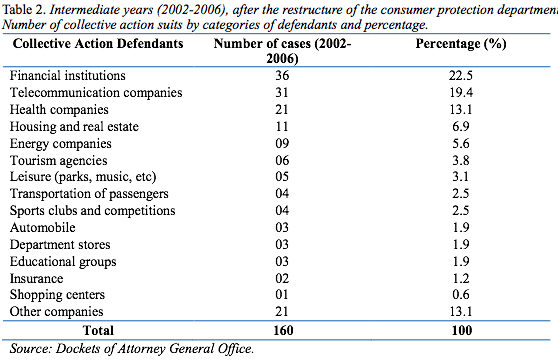 Between 2007 and 2010, the consumer protection prosecutors filed 221 collective actions against private companies. Before suing private companies, public prosecutors usually propose deals to them. These deals often involve the commitment to stop breaking the law and to pay compensatory damages to the harmed consumers. The conditions of such payments are negotiable and may be parceled according to the company’s financial capacity. However, most companies refuse to negotiate and prefer to litigate. Assuming that companies are usually risk averse and make decisions based on rational analysis, it is clear that the system lacks economic sanctions to deter them from continuing to break the law. The next section will identify who the defendants are in these 405 cases, throughout the twenty years of existence of the consumer protection department of the Attorney General Office of Rio de Janeiro. Mapping the dockets of consumer protection collective actions, one should also observe three different time periods: early years (1991-2001); intermediate years (2002-2006); and recent years (2007-2010). In the early years, 24 collective actions were filed. Financial institutions and telecommunication companies were already among the usual defendants. Some of these early collective actions tried to limit financial interest rates and were not successful, given the reluctance of the judiciary to intervene in economic matters. All the three collective actions against telecommunications companies focused on abusive advertisement practices to sell telephone lines. In those early years, there was also a significant number of collective actions against real estate and housing companies. In one of these cases, apartments were sold, but not delivered to all the future proprietors. Two other cases involved illegal charges due to inflation losses. Finally, a fourth case involved the collapse of a building that had to be demolished due to project failure and the use of low quality construction materials. This case established a relevant precedent, since it was ruled that public prosecutors should not file collective actions on behalf of apartment proprietors and that these home-owners needed to go to courts to defend their own rights. As a direct consequence, the percentage of collective actions against housing and real estate companies decreased significantly in the following years, involving mostly contractual issues rather than construction failures. There were no collective actions against transportation or energy companies in those early years. These types of companies gradually became repeat offenders during the intermediate years and defendants in many different collective actions in recent years. There are two different explanations for the complete non-existence of petitions filed against energy and transportation companies during those early years. First, civil investigation to collect evidence of malfunctioning services requires a very sophisticated structure and the public prosecutors lacked it during the 1990’s. Second, during those early years, the electricity company, ferry, subway, and urban train system were public. They were privatized by the end of that decade and consumers’ claims for better services significantly increased in the following years. In the intermediate years, the dockets show a much wider variety of cases, including different business sectors and leisure activities. The range of cases varied from accidents in amusement parks to abusive negotiation of graveyards. The enactment of the Sports Fan Statute (Lei n. 10,671/03) recognized that sports fans have the status of consumers and established the legal basis for suing clubs and federations. Furthermore, the rising competition between tourism agencies resulted in a series of collective actions due to false advertisement, fraudulent behaviour, and illegal charges. Educational groups were also held liable for charging illegal fees. In addition, transportation and energy companies finally appeared as defendants in consumer protection collective actions in these intermediate years. Nonetheless, the usual defendants continued to violate the CDC and most class actions were filed against financial institutions, telecommunications companies, health companies, and real estate firms. During these intermediate years, these four types of companies were defendants in 61.9 % of all cases, a percentage not too far from the early years: 70.8 %. In recent years, financial institutions and telecommunication companies continued to be sued by public prosecutors. In absolute terms, there were 36 collective actions against financial institutions in each of the periods. Regarding telecommunication companies, the number of consumer protection collective actions increased from 31 (2002-2006) to 36 (2007-2010). These companies have maintained their status of ‘usual suspects’ and are private companies that continue to break the law, regardless of the fact that they are repeat defendants in mass consumer violations collective actions. It is also important to note the substantial growth in the number of cases involving buses, trains, subway, taxis, and the ferry system: 1275%. Although I did not collect specific data on the fines imposed on these companies by the State Transportation Agency (Agetransp) and by the Transportation Authority (DETRO and SMTr), one possible explanation may come from the lack of effective control by the regulatory agencies and executive authorities. For years, public prosecutors requested information from these bureaus and did not receive the requested reports. By 2010, however, there was a positive transformation in the Municipal Authority, whose Secretary focused more closely on inspections and quality control. Since then, detailed and prompt reports have been regularly sent to the Attorney General Office’s Consumer Protection Department. In the first three months of 2011, no collective action was filed against a transportation company. Regulatory agencies and executive authorities also play an essential role in the case of consumer protection. If they regulate their markets in accordance with the CDC, private companies will have a clear set of rules to comply with. However, defining guidelines, norms, and duties is not sufficient. Without properly sanctioning wrongdoings, these agencies and authorities will witness the phenomenon of lucrative illegality: companies will constantly break the law, if they have economic incentives to do so. In the present article, however, I do not attempt to describe the phenomenon of lucrative illegality by observing regulatory agencies. The focus is on the ineffectiveness of the Brazilian system of collective litigation. 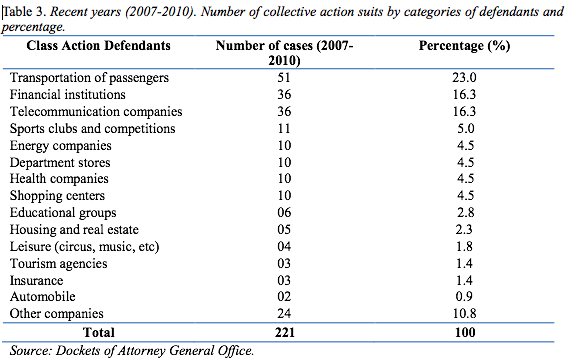 The next section will analyse all 160 collective action suits from the intermediate years and their outcomes. Quantitative research indicates two main reasons for the ineffectiveness of Brazilian consumers’ collective actions. First, the lack of economic sanctions for wrongdoers provides economic incentives for companies to break the law. Second, the slowness of the Brazilian justice system affects its capacity to prevent new delinquencies. Analysing the sample of 160 collective action suits, there is not a single case of a definitive conviction obliging a company to pay punitive damages. Companies were convicted in 21 cases, but effective economic sanctions were not imposed in any of these judgements. They were acquitted in 29 trials. Public prosecutors and private companies’ lawyers set deals in 34 class actions and negotiation almost always involved the defendant’s commitment to compliance with the CDC without the imposition of any economic sanction due to a previous breach of legislation. Exceptionally, once, private banks agreed to pay a six million dollars fine as part of a deal with the consumer protection department. 72 class actions are still waiting for sentences or final appeal judgements. In only three of these cases were private companies convicted to pay punitive damages. Due to illegal advertisement, a transportation company was convicted to pay US$ 300,000. For the same reason, a telecommunications company may be obliged to pay US$ 40,000. Finally, due to unlawful fuel trade, three different gas station companies were sentenced to pay US$ 40,000. All three of these convictions were confirmed by the state court of appeals and are waiting for the judgement of another appeal at the STJ. In addition to the lack of punitive damages, the complex Brazilian litigation system also fails to oblige private companies to compensate consumers for their economic losses. Unlike the American system, Brazil does not have a procedure of discovery to collect evidence under rules of full disclosure. Therefore, companies are not forced to provide detailed information of the illegal fees charged or to reveal the total amount of profit that resulted from breaking the law. Moreover, the Brazilian system does not have an effective procedure of fair notice. According to the CDC, consumers shall be warned on the existence of a class action suit by reading the state court of appeals official daily bulletin. As a consequence, most consumers are unaware of these cases and do not follow the judgements. Finally, the Brazilian collective litigation system requires consumers to be proactive in order to receive compensation. Once a definitive judicial decision convicts a private company to compensate victims for their economic losses, the Brazilian system expects each consumer to hire a lawyer and to individually enter in the collective action suit to demand for his or her share of compensation. Considering that most of these cases are related to the illegal charge of a few dollars, the majority of victims do not take the trouble to claim their compensatory damages in courts. Given the lack of information on the total amount of economic losses, public prosecutors may not be able to force these companies to make a deposit at the Consumers’ Defense Fund, as an alternative for the individual compensation of consumers. Examining all 21 of the collective action trials with definitive convictions, there is no case in which individual consumers were properly compensated. As a matter of fact, nine sentences declared that there was a breach of law and obliged the companies to comply with the CDC, but did not convict these defendants to pay compensatory damages. A further 12 convictions obliged companies to fully compensate victims’ losses, but ultimately these decisions did not impose economic sanctions on wrongdoers since individual consumers did not claim their share of damages and prosecutors still did not enforce the fluid recovery clause. It is worth noting that these convictions are not merely symbolic since judges take the necessary measures to enforce their own orders after the class action trials. Therefore, once a judicial order of compliance with the law is definitive, judges will impose a significant fine to disobedient companies. Most financial institutions and telecommunication enterprises do not challenge these judicial decisions and tend not to commit the same wrongdoing repeatedly. On the other hand, since these defendants do not experience any kind of economic punishment for their previous delinquencies, they do not have effective incentives to refrain from charging other illegal fees, breaking other clauses of the CDC, or adopting any other abusive practice. Empirical data reveals that they face minimum risk of suffering any kind of economic punishment as long as they do not challenge a judge’s prohibitive order. This context of under-deterrence provides a clear explanation for all the deals negotiated without the imposition of economic compensation. Currently, public prosecutors do not expect to impose punitive damages through consumers’ class actions and they are aware that individual victims are unlikely to claim compensatory damages in these cases. Therefore, these prosecutors have clear incentives to negotiate deals in which private companies commit themselves to immediate compliance with the law. Since collective litigation in Brazil often last for many years, companies may settle once they are risk averse and foresee a concrete risk of economic punishment. There is just one exception when a financial institution decided to pay six million dollars in order to settle, probably preventing the risk of being convicted with a larger economic punishment in a collective action trial. Finally, there are several collective actions waiting for a final decision. From the dockets of the intermediate years, 72 collective actions are still waiting for sentences or final appeal judgements. In 26 cases, there was already a sentence from the corporations’ court judge and an appeal was judged by the state’s higher court. These cases are waiting for a final decision from the Supreme Court or from the STJ. 29 collective actions were judged by the corporations’ court judge and are waiting for the judgement of an appeal. There are still 17 collective litigation trials waiting for a lower court sentence by the corporations’ judges. Slowness is extremely harmful to consumers for several reasons. First, they are often deprived of monetary resources illegally retained by private companies. Second, in the absence of an injunction, companies will continue to repeat the disputed practice until a definitive decision and will constantly deprive consumers of their rights. Third, prolonged time lengths will demobilize consumers and individual victims are not likely to be fully compensated by private companies. 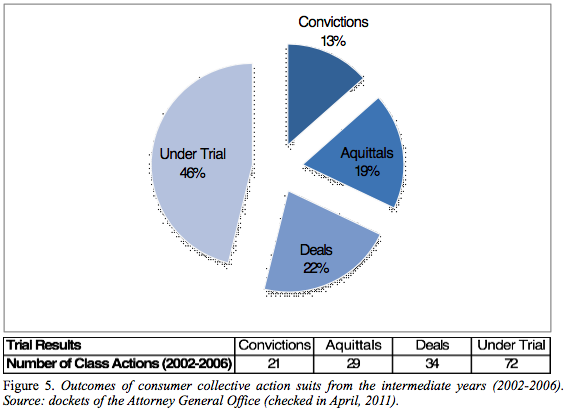 In addition to the quantitative analysis, nine legal actors were interviewed: three public prosecutors; two judges; one public defender; one attorney of the State House of Representatives Consumers’ Defense Commission; two lawyers of private companies (one from a financial institution and one from a telecommunication enterprise). All of these legal actors are currently working with consumers’ class actions in Rio de Janeiro and their opinions come from years of professional expertise in the field. Interviews were conducted with a view to find their opinions on punitive damages, economic sanctions, and the phenomenon of lucrative illegality. Plaintiffs, for example, criticised the lack of punitive damages in collective litigation in Rio. According to the public defender, the Commission’s attorney, and the public prosecutors, private companies are almost never convicted to pay punitive damages. According to these professionals, courts are conservative: judges were forged in a legal culture of classical civil liability and, therefore, they are reluctant to punish companies for their wrongdoings. Their sentences are often limited to prohibiting an illegal act and to compensating for patrimonial damages. Two interviewees referred to the fact that collective litigation is relatively new in Brazil and that doctrine is still not consolidated, hoping that legal culture will admit punitive damages in the future. Two interviewees referred to the American origins of punitive damages and the prejudice that some iconic cases nurtured in the Brazilian legal community. The public defender also remembered the fact that there is no law that clearly admits punitive damages in Brazil. One of the judges also referred to the non-existence of a legal mandate as to the explanation for the lack of a culture of economic punishment. Asked specifically about whether the concept of ‘collective moral damages’ could allow the conviction of companies to pay punitive damages, all the interviewees agreed, except the bank’s lawyer. He argued that moral damages are personal and do not affect society as such. The telecommunication’s lawyer admitted punitive damages, but also mentioned the fact that ‘collective moral damages’ did not seem to be an accurate concept. She claimed that there is a culture of vengeance in Brazil, in which public departments sue private companies based on a false idea of economic imperialism. In her view, there is a widespread myth that private companies always attempt to maximize profits by providing minimum levels of service. According to her, punitive damage is a dangerous imitation of a foreign concept that may eventually ruin businesses and lead to the bankruptcy of private companies. Ironically, however, the same lawyer admitted that punitive damages have not been excessively expensive for private companies. As a practical matter, there were no economic sanctions imposed on her company due to consumer protection collective actions. This is not to say that there were no internal consequences. On the contrary, whenever a collective action suit is filed, the company’s legal department is concerned with the possible conviction, the negative publicity, and the inherent economic risks. Risk aversion of suffering punitive damages affects the business and private companies always invest more resources in order to prevent economic sanctions. On at least one occasion, the company was not originally committed to invest in a given service and massive investment in that service only came as the result of a class action suit. The lawyer explained that this case was exceptional since denying consumers’ rights to maximize profits is not part of the company’s policy. According to her, the company’s legal department has a veto power that may be overridden only by the CEO. If the lawyers demonstrate that a contractual clause or a given practice is illegal, their legal advice is not submitted to a business plan that evaluates whether benefits are superior to potential costs. However, cost and benefit analysis is the rationale of the company whenever they commit an unpredictable illegality. In these cases, caused by market malpractices, doctrinal change, and regulatory failures, it is usually more beneficial to pay damages to the few consumers that file suits than to improve their service’s quality. Most interviewees are concerned with the possibility that the system creates incentives for frivolous litigation and unreasonable convictions. However, all the legal actors praised the Brazilian collective litigation system, since private companies are not supposed to pay punitive damages to individual consumers, but to a Fund of Consumers’ Rights Protection. All of them consider this legal solution to be an interesting alternative to the American model of civil justice, in which punitive damages may benefit one individual litigant. One of the judges stated that such a system encourages consumers to suffer harm and eventually take steps to maximize the negative consequences of a company’s wrongdoing, simply to be entitled to a higher reward. Not only does such a system stimulate bad faith, but it also produces more externalities and society would have to bear such excessive social costs. It is worth noting that most interviewees referred to iconic American cases to express their concern about exaggerated economic sanctions. Five interviewees mentioned the McDonald’s coffee case as an example not to be followed by Brazilian courts. Three interviewees commented vaguely that the United States was known for excessive monetary rewards, but they did not affirm anything about these cases that were merely anecdotal evidence to them. One public prosecutor also referred to the McDonald’s coffee case and to the Pinto case, but to praise the American civil justice system and its capacity to influence operational routines and decision-making within private companies. The Pinto case was also mentioned by one judge as an example of the importance of punitive damages. Another judge criticized not only the excesses of the United States, but also the apathy of France. According to her, the French consumer is often unprotected and private companies always claim that they are not liable for any harm caused to a consumer. In her opinion, the Brazilian system is the best since it is the most balanced. Except for the private lawyers, all the legal actors defended the existence of punitive damages in Brazil and stated that the lack of punitive damages will almost always produce economic incentives for private companies to break the CDC. The bank’s lawyer argued that financial institutions are too concerned with their image and with bad publicity and punitive damages are, therefore, unnecessary. The telecommunication’s lawyer claimed that punitive damages would be internalised as costs, and consumers would have to pay for them through higher prices or lower quality services. Both judges mentioned that excessive punishment may be harmful to consumers. They both highlighted the fact that imposing punitive damages involves a complex equation and that the economic sanction has to be proportional. According to one judge: punishment should not ruin business; it should not discourage investors; and it should be in the consumers’ interest, as opposed to detrimental to them. When asked about the factors that should be taken into consideration to fix the amount of punitive damages, the interviewees mentioned: (i) size of the company; (ii) amount of harm caused to the victims; (iii) amount of profit gained due to the wrongdoing; (iv) capacity to prevent further wrongdoings; (v) degree and severity of misconduct. It was not possible to conclude from their answers whether these factors are hierarchical. As one of the public prosecutors put it, these parameters are supposed to come from a large number of practical judgements. However, courts have rarely – if ever – examined the criteria for the amount of punitive damages in a consumer class action. In addition, Brazilian scholars do not discuss them. It is clear, therefore, that the lack of punitive damages helps explaining the phenomenon of lucrative illegality, since ‘collective moral damages’ remain simply as part of the ‘law in the books’ rather than the ‘law in action’. The next section will show that the Brazilian consumer collective actions system also lacks other economic sanctions. In addition to punitive damages, private companies may suffer other economic consequences as the result of a consumers’ protection collective action. For instance, a bank or telecommunication company may be convicted to reimburse an illegal fee that was charged to its clients. 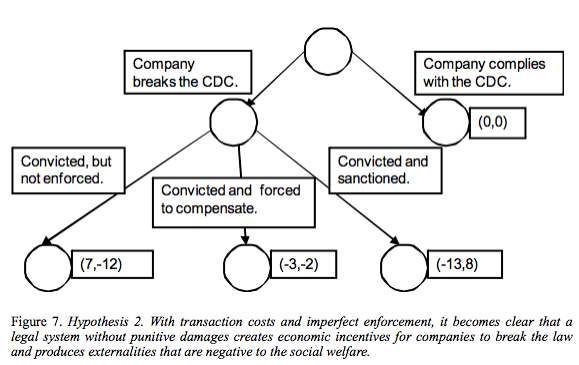 American researchers often criticise collective action settlements due to the temptation to collude and the fact that victims may receive less money or even discount coupons, which will require new purchases at the defendant’s company. In Brazil, however, the scenario is even worse in terms of economic rewards since individual customers are expected to be proactive in order to receive compensation. The Brazilian collective litigation system expects each consumer to hire a lawyer and individually enter into the collective action suit to demand for his or her share of compensation. According to the quantitative analysis, there were only 21 definitive convictions in the intermediate years and none of them resulted in compensation for individual victims. Both judges were aware of this phenomenon and stated that individual consumers almost never benefit from a collective action. One of them even said that he does not remember of a single individual compensation in his many years at the bench. The other judge referred to the compensation of a consumer as an extremely rare phenomenon. Their opinion is coherent with the quantitative analysis and was shared by all the other legal actors. The bank’s lawyer explained that the Brazilian collective litigation system is still maturing. In the early years, consumers’ class actions were extremely rare and it was not clear whether the CDC also regulated financial institutions. According to him, only a few collective actions against banks got definitive sentences and are now ready to be enforced. In these cases, individual consumers usually only filed their individual suits against banks or simply did not follow the collective action trials. Therefore, once there is a definitive sentence, individual victims are not informed or are already compensated through other means. The telecommunications’ lawyer added that not only is Brazilian civil justice slow, but many collective action suits claim small compensatory damages. Only a few customers claim these compensatory damages through individual law suits, in which the company may make deals and pay higher extra-patrimonial damages. Only a small percentage of customers file individual suits and ultimately the company may benefit from the fact that the mass of consumers is not compensated as a whole. As the lawyer put it, her telecommunications company still had not had to pay any kind of economic sanction whatsoever due to a consumers’ collective action. The plaintiffs also confirmed that individual compensation through collective litigation is rare in Brazil. All the interviewees agreed that a less bureaucratic system would be much more effective. They all considered that the necessity to hire a lawyer to demand compensation was a strong obstacle to individual compensation in class actions. However, both judges were puzzled by the idea of abolishing this formality and could not conceive of a different system. Some plaintiffs suggested the possibility of conceiving administrative measures to enforce the judicial decisions in a hybrid system that would reconcile the independence of judges with the lower costs and higher level of information of regulatory agencies and other administrative bureaus. Most legal actors consider injunctions to be the most effective method of consumer protection. Both judges stated that their orders are almost always followed and, if not, they imposed and charged higher fines. Both private lawyers agreed that their companies do not defy judicial orders, even if they disagree with the decision. Unless a judicial order is infeasible, they claim that they will never disobey. Plaintiffs agree that injunctions may be very effective, but complain that sometimes judges are reluctant to charge fines. In any event, they all agree that economic sanctions may come more easily when a private company challenges a judicial order than otherwise. As the interviews reveal, Brazilian companies benefit from breaking the law and violating consumer rights. What can be done to prevent their wrongdoings and eliminate the phenomenon of lucrative illegality? The bank’s lawyer argued that dialogue between companies, regulatory agencies and class action plaintiffs is necessary. According to him, financial products and services should gain the prior approval of consumer protection departments in order to prevent further wrongdoings. Financial institutions are often liable because the CDC is not clear. The telecommunications company lawyer claimed that more collective action suits are necessary, since they cause real internal impact on the business. In addition, she stated that immediate measures that affect profit are the most effective ones. For instance, if the corporation is not performing a given service correctly, prohibiting the company from contracting new customers for that service is the most effective way of forcing immediate investments. In addition, negative publicity in the media is also extremely effective to prevent further wrongdoings. Finally, she added that CEOs fear personal liability much more than punitive damages. Therefore, injunctions and sentences would be more effective if they imposed economic sanctions on the CEOs and eventually prohibited them from directing a company for a given period of time. Punitive damages are not imposing sanctions on CEOs; they are punishing shareholders or consumers. One of the judges also thought that the disregard of legal entity doctrine would be an effective way of preventing lucrative illegality. According to her, there is not a single formula, but many different instruments that ought to be used more promptly and more often: injunction orders; punitive damages; prohibition of services; recall of products; and apprehension of goods. She also highlighted the importance of the media and suggested that companies should have an obligation to publish the summary of a definitive conviction, so that individual consumers may be aware that they are entitled to compensation. The other judge believes that Brazilian courts should develop a culture of imposing fines and other economic sanctions, such as punitive damages. All the public prosecutors, the Commission’s attorney, and the public defender considered punitive damages to be an effective way to prevent further wrongdoings and to eliminate the phenomenon of lucrative illegality. One of the public prosecutors suggested that class actions suits should have priority over other cases due to their impact over multiple individuals. The other prosecutor added that the civil justice system should use new channels of information technology to broadcast class action suits. Another public prosecutor emphasised the personal liability of CEOs and the disregard of legal entity doctrine as the most effective instruments to prevent further wrongdoings. The Commission’s attorney praised injunction orders as the most effective tool for eliminating lucrative illegality. Finally, the public defender suggested that proportional companies’ assets should be frozen whenever they are accused of harming consumer rights so that they would not benefit from these resources during litigation. The empirical research demonstrates, therefore, that the system should be reformed and that more effective enforcement mechanisms and economic sanctions should be developed to prevent further wrongdoings. The next section will provide a case study showing how companies repeatedly break the law, once they do not have appropriate disincentives to comply with the legislation. V. Why Do Companies Constantly Break the Law? As a case study, an on-going litigation case reveals the incentives that Brazilian companies have to break the law. C-TV (‘Cable TV’), a leading telecommunications company in the country, decided to charge R$ 10 – ten reais, corresponding roughly to two pounds – per month of all consumers who pay their bills via banks. However, this ‘bank payment fee’ (‘Tarifa de boleto bancário’) is prohibited by regulatory agencies. Both the Brazilian Central Bank (equivalent to the Bank of England) and the National Telecommunications Agency (ANATEL) defined the acceptance of payments as a typical banking function, which may not be subject to any fees whatsoever. After all, because banks profit from money lending and high interest rates, financial institutions already benefit from the accumulation of monetary resources resulting from these payments. Additionally, the payment itself is not a service that adds value to the consumer, since he or she benefits from television broadcasting, but not from payment. Therefore, according to Brazilian regulation and laws, charging ‘bank payment fees’ is unlawful conduct and is consequently prohibited. Why then would C-TV charge these illegal fees? C-TV charges its clients because the company has economic incentives to do so. Since Brazilian courts rarely convict companies to pay punitive damages and most convictions are not effectively enforced, C-TV has strong economic incentives to break the law. If the company complies with the CDC and with federal regulation, there is no payoff to C-TV or to its clients. In a scenario of ineffective enforcement, in which a company is convicted but ultimately not forced to compensate or pay any extra-patrimonial damages, C-TV would have a payoff of R$ 10 per month for every single consumer who pays his or her bills through the banking system. Conversely, each one of these cable television viewers lost R$ 10 per month and did not recover the money. Assuming that there is perfect enforcement, then both the company and consumers would not have any payoffs, but that is not a realistic scenario. On the contrary, companies almost never fully compensate for the harm caused collectively to its clients in Brazilian collective litigation. As discussed before, ineffective enforcement results in under-deterrence and fosters repeated cycles of lucrative illegality. The mainstream assumption in Brazilian academia is that there is no difference in payoffs between (i) compliance with the law and (ii) illegality followed by conviction and patrimonial compensation. According to Teori Zavascki and other Brazilian authors, damages are limited by essentially being the necessary monetary resources to fully compensate wrongdoings. However, one should not admit the imposition of extra-patrimonial damages (such as the ‘collective moral damages’) in order to punish companies for mass consumers’ rights violations. Their argument follows the idea that such punitive damages would represent excessive costs that would be internalised by the companies and transferred to their shareholders or consumers. In other words, punitive damages should never be admitted in the Brazilian legal system due to the harmful economic consequences. However, the academic thesis relayed above – which I will term ‘hypothesis 1’ – does not relate to reality. Empirical observation demonstrates that many other analytical elements must be included in this context. The analysis must involve transaction costs evaluation, the repeated game circumstance, and the imperfect enforcement scenario. One should not ignore, for instance, that law enforcement through class action would necessarily imply litigation costs that we may estimate at R$ 2 (20 % of the litigation value, following the Brazilian tradition). As a matter of experience, when a company is convicted, there is often reputational loss and a value reduction of the company that we may estimate in R$ 1. We should also consider litigation costs that affect consumers’ payoff. In the Brazilian legal system, consumers do not have to cover plaintiff litigation expenses. Nonetheless, time erodes the value of their monetary compensation. Legal interest rates are 12% per year, inferior to investments and loan rates, which is a monetary loss that we could estimate to be equivalent to R$ 2. This much more sophisticated socio-legal context is related to reality and I will term ‘hypothesis 2’. We can see that the optimal outcome – in which companies and consumers do not have payoffs and society’s wealth is not minimized – requires companies’ compliance with the CDC. In addition to the transaction costs evaluation, we should also consider the imperfect enforcement scenario and the repeated game circumstance. Private companies are often repeated players in consumer protection class actions. In particular, telecommunication companies are always among the top few on the list of consumers’ complaints. C-TV, the defendant in this case, had been sued several times by public prosecutors in the past ten years. Experience as a defendant certainly showed C-TV that the company is litigating in a scenario of imperfect enforcement, in which punitive damages are rarely imposed and most companies are convicted, but not forced to compensate consumers’ damages. In this scenario, C-TV has clear economic incentives to break the law repeatedly. In scenario A, C-TV faces minimum risks of being convicted to pay punitive damages and minimum risks of being forced to pay compensatory damages. C-TV is likely to be convicted, but without the sentence’s enforcement. Estimating the probabilities from data collected for this research, there seems to be a 1% chance of paying punitive damages; 3% chance of paying compensatory damages; and 96 % chance of not paying anything, except litigation costs and reputational loss. In such a realistic scenario, the expected payoff for C-TV is $ 6.5. Let us now consider a different scenario B, in which legal reform improves remedies and a significant quantity of sentences are now under effective judicial enforcement. However, the focus of legal reform is limited to the enforcement of compensatory damages, since legal culture rejects punitive damages. Thus, legislature prohibits all forms of extra-patrimonial damages in collective litigation, regardless of the given denomination (‘collective moral damages,’ ‘punitive damages,’ or any other name). Estimating the probabilities, let us assume that there is a 0% chance of paying punitive damages; 50% chance of paying compensatory damages; 50 % chance of not paying anything, except litigation costs and reputational loss. In such a scenario, the expected payoff for C-TV is $ 2. Let us finally consider scenario C, in which legal reform not only improves remedies, but also establishes a regime of balanced and clear criteria to impose punitive damages on private companies. Thus, legislature is aimed at optimal deterrence and it is stated that punitive damages should be imposed when deterrence would otherwise be inadequate because of the possibility that injurers would escape liability. Estimating the probabilities, let us assume that there is a 20% chance of paying punitive damages; 40% chance of paying compensatory damages; 40 % chance of not paying anything, except litigation costs and reputational loss. In such a scenario, the expected payoff for C-TV is $ -1. Reflecting on these three different scenarios, we can understand why Brazilian companies continue to break consumer law. In scenario A, imperfect enforcement provides excellent economic incentives for C-TV to charge the illegal fee. Even with litigation costs and reputation loss, given the small probability of facing economic sanctions, the expected payoff is $ 6.5. Scenario A seems to be similar to the current Brazilian scenario, given the rejection of punitive damages by courts and very low enforcement. In B, a hypothetical scenario, the lack of punitive damages still creates an environment of limited economic sanctions for C-TV. Therefore, even though legal reform improved enforcement and reduced economic incentives to break the law, the expected payoff is still $ 2. Private companies are still encouraged to violate the CDC. In C, an alternative scenario, legal reform improves existing remedies and establishes a regime of punitive damages, providing courts with effective tools to impose economic sanctions as a consequence of mass consumers’ violations. In such scenario, the expected payoff is $ – 1 and the private company is unlikely to break the law. This case study and the empirical observation of consumer class actions provide explanatory factors for the phenomenon of lucrative illegality. Many American scholars criticise the criteria for applying punitive damages in the United States. Joni Hersch and W. Kip Viscusi, for instance, compared decisions made by juries and by judges, concluding that jury awards are highly unpredictable and unrelated to compensatory damages as opposed to the judicial decisions. Cass Sunstein also coordinated empirical research that pointed to the necessity of punitive damages reform to eliminate erratic and extremely expensive convictions. Observing Brazilian legal culture and the sample of consumer collective actions in Rio de Janeiro is also relevant for reflecting upon the American judicial system. Lack of economic sanctions creates incentives for Brazilian companies to break the law. Therefore, both the U.S. Supreme Court and the Brazilian STJ should not eliminate punitive damage or ‘collective moral damage’ awards and should not impose limitations that prevent courts from sanctioning companies effectively. The extremely limited number of convictions to make companies pay punitive damages has a direct impact on the deals settled between public prosecutors and private companies. Almost all the settlements in Rio did not impose economic sanctions on private companies because punitive damages are not likely to result from the judgement of these collective action suits. The correlation between settlements and punitive damages awards was also sustained by Mitchell Polinsky in his study of the American system, the difference being that damages induced companies to make an agreement and to settle the class action suit. As one judge pointed out, companies are more likely to break the law in less competitive markets. Telecommunication companies and financial institutions operate in limited markets and may establish barriers for customers to leave their contracts. Fidelity clauses, transaction costs, and other restrictions may limit the ability of a consumer to have a new bank account with a different bank or leave a phone company for its competitor. On the other hand, companies are less likely to break the law in more competitive markets. Moreover, both the bank’s lawyer and the telecommunications company’s attorney eloquently affirmed that their companies do not assess the potential economic risks of consumer rights violation under a cost-benefit analysis before making decisions. On the other hand, it was admitted that such analysis was made after a consumer collective action suit was filed. I propose a counter-intuitive interpretation of their statements. Contrary to the common-sense idea, the non-existence of a cost-benefit analysis is not evidence that these companies respect consumers’ rights and will not break the law to pursue illegal profits. Lack of cost-benefit analysis is clear evidence that Brazilian private companies do not expect to be punished due to massive consumers’ rights violations. Unless courts take economic sanctions seriously and punish private companies for their wrongdoings, Brazilian companies will constantly break the law. Image by Pedro Fortes shows him appearing at a public hearing in the Brazilian Congress as a legal expert and answering questions from congressman Romario. Associate Professor of Law, FGV Law School, Rio de Janeiro and a DPhil Candidate at the Centre for Socio-Legal Studies, Faculty of Law, University of Oxford. I served as state public prosecutor at the consumer protection office for three years and was responsible for dozens of class actions in Rio de Janeiro. Although my reflection on the subjects described here benefited greatly from this professional position, the conclusions expressed here do not correspond to the opinion of the Attorney General´s Office of Rio de Janeiro on such topics (pedro.rubimborgesfortes@st-hildas.ox.ac.uk). This article was selected for the Fourth International Junior Faculty Forum, co-sponsored by Harvard Law School and Stanford Law School. Previous drafts were discussed at the FGV Faculty Workshop (Rio de Janeiro), at the Institute for Law and Finance at the Goethe University (Frankfurt), at Harvard Law School (Cambridge), at the ITAM Faculty Workshop (Mexico City), at the GRIPS seminar, at the Nuffield College, University of Oxford (Oxford), and at the Faculty Colloquium of the Georgetown Centre for Transnational Legal Studies (London). I am grateful for all feedback received and already incorporated into the article. I am particularly in debt with Dean Joaquim Falcão for his support for empirical research at FGV Law School. I am thankful to Shunko Rojas, Antonio Porto, Marcio Grandchamp, Luis Borges, Feliciano Guimarães, Ricardo Morishita, Tobias Tröger, Agustin Barroilhet, Gisela Mation, João Paulo Ferraz Vasconcellos, Stewart Macaulay, Carol Steiker, Deborah Hensler, Rogelio Perez-Perdomo, Lawrence Friedman, Bruno Salama, Mariana Pargendler, Joyce Sakda, Virgilio Andrade, Raymundo Gama, Yvonne Salt, Aron Szekely, Dingeman Wiertz, Katharina Grabietz, Denis Galligan, Christopher Hodges, Stefan Vogenauer, Alvaro Santos, Avi Bourassa, Filiz Wölfle, Hang Xiao, Conner Pine, Gregory Reith, Giovanni Papotti, Brigid McCarthy, Elena Tan, and Luis Guillermo Rosero for reading earlier drafts and providing extremely helpful feedback. Anelise Jordão and Lucas Thevernard were valuable research assistants. Two anonymous reviewers also made fairly helpful comments, suggestions, and critiques. I am particularly grateful to Po-Hsiang Ou and Matilde Gawronski for their excellent editorial assistance and guidance on how to incorporate the feedback from these anonymous reviewers. Thanks also Christiane Haschka Fortes for her encouragement and support with figures and tables. Finally, I must thank all the legal professionals involved with the consumer’s protection community in Rio de Janeiro for spending their valuable time with me and sharing their thoughts on the subject. Without the collaboration of these public prosecutors, public defenders, judges, members of the executive branch, and company lawyers these paper would never be written. Carlos Alberto Bittar Filho, Do dano moral coletivo no atual contexto jurídico brasileiro, in Revista de Direito do Consumidor, volume 12 (out-dez 94); André de Carvalho Ramos, A ação civil pública e o dano moral coletivo, in Revista de Direito do Consumidor, volume 25 (jan-mar 98); Leonardo Roscoe Bessa, Dano moral coletivo, in Revista de Direito do Consumidor, volume 59 (2006). I owe to the insightful comparative mind of Stefan Vogenauer the precise suggestion that ‘chamber’ would be the appropriate translation to refer to the different ‘turmas’ of the STJ. REsp 971844/RS. The opinion of the court, written by Judge Zavascki, states that there is no possibility of convicting companies to pay collective moral damages in consumer class actions. REsp 971844/RS. In his concurrence, Judge Fux expressed concerns over the economic consequences of convicting companies to pay collective moral damages in consumer class actions. CARLOS ALBERTO BITTAR FILHO, Do Dano Moral Coletivo no Atual Contexto Jurídico Brasileiro, Revista de Direito do Consumidor, São Paulo: RT, 1994, v. 12, page 55. ANDRÉ DE CARVALHO RAMOS, A ação civil pública e o dano moral coletivo, Revista de Direito do Consumidor, São Paulo: RT, 1998, v. 25, page 83. HUGO NIGRO MAZZILLI, A DEFESA DOS INTERESSES DIFUSOS EM JUÍZO, Saraiva: São Paulo, 21ª edição, (2008), page 146. FREDIE DIDIER JR e HERMES ZANETI JR, CURSO DE DIREITO PROCESSUAL CIVIL: PROCESSO COLETIVO, Podium: São Paulo, 4ª edição (2009), pages 295-296. LEONARDO ROSCOE BESSA, Dano Moral Coletivo, Revista de Direito do Consumidor, São Paulo: RT, 2006 , v. 59. TEORI ALBINO ZAVASCKI, PROCESSO COLETIVO: TUTELA DE DIREITOS COLETIVOS E TUTELA COLETIVA DE DIREITOS, São Paulo: RT, 4ª edição (2009), page 40. Justice Zavascki left the STJ and became a Justice of the Brazilian Supreme Court on November 29th 2012. The leading case in question was Attorney General Office of Minas Gerais vs Municipality of Uberlância and Canaã Housing Enterprises Ltd (REsp 598281, 01/06/2006). The environmental protection department of the Attorney General Office filed a petition against municipal authorities and a housing company due to an illegal project that caused environmental degradation. The housing company and the municipality were convicted and ordered to demolish all the houses, recompose the degraded areas and restore local nature. In addition, the lower court judge sanctioned the defendants with an amount of R$ 50,000 (equivalent to about US$ 25,000) due to the collective moral damage caused by their careless and illegal conduct. In the appeal’s judgement, the higher court overruled the conviction of collective moral damages, stating that moral damages are only awarded if there is individual suffering. The higher court concluded that there is no such legal concept as ‘collective moral damage’ in Brazilian law. Then, the Attorney General Office of Minas Gerais filed a Special Appeal to the STJ, and the case was distributed to the 1st circuit. Justice Fux (joined by Justice Delgado) wrote the minority opinion, in which he endorsed the idea that Article 6, VI, of the Consumers Defence Code (CDC) and Article 1 of the LACP enable judges to convict class action defendants to pay collective moral damage. Citing an array of academic opinions, Justice Fux sustained that “the major concern of judges, in these cases, is to prevent environmental damages, given the constitutional status of environmental protection, one should not interpret the law in a way that restricts this protection.” Concluding his opinion, Justice Fux mentioned that patrimonial damages and extra-patrimonial damages should coexist, interpretation that favours the balanced and healthy environment guaranteed by the Brazilian constitution. Justice Falcão joined the opinion. Justice Arruda concurred, but admitted the possibility of imposing collective moral damages. In her opinion, she pointed out that “there will be, surely, situations in which the extra-patrimonial damages will be compensated by objective measures of physical restoration and by a monetary compensation due to diffuse and collective moral harm.” Nonetheless, Justice Arruda did not find evidence of extra-patrimonial damage to the community in the case. Despite being a split decision, the case set a precedent in the 1st chamber of the STJ. In the following judgement of the court, Attorney General Office of Rio Grande do Sul and Municipality of Uruguaiana vs. Eletrojan Lighting and Electricity Ltd (REsp 821.891-RS, 12/05/2008), Justice Fux wrote the unanimous opinion of the court, following the precedent established in the previous judgement and stated that collective moral damages are inadmissible. The 1st chamber had another opportunity to endorse its precedents in two other cases. In Federal Attorney General Office vs. Brasil Telecom S/A and National Telecommunications Agency (ANATEL) (REsp 971.844/RS, 12/02/2010), Justice Zavascki wrote the opinion of a unanimous court, following the previous decisions. Justice Fux wrote a concurring opinion simply to express his concern with economic risks, unpredictability of lower courts, and the necessity of guaranteeing the economic balance of contracts in the telecommunications market to protect the rising investments. In a companion case, Federal Attorney General Office vs. Brasil Telecom S/A (REsp 1109905, 03/08/2010), Justice Carvalhido wrote the opinion for a unanimous court and followed the same line. Attorney General Office of Rio Grande do Sul vs. Bento Gonçalves Transportation Enterprises Ltd. (REsp 1057274/RS, 01/12/2009). Federal Attorney General Office and National Telecommunications Agency (ANATEL) vs. Brasil Telecom S/A (REsp 1150530/SC, 18/02/2010). Federal Statute nº 8.078/90 (CDC). Article 82 of the Consumers Defense Code (CDC). See ANTONIO GIDI, A CLASS ACTION COMO INSTRUMENTO DE TUTELA COLETIVA DE DIREITOS: AS AÇÕES COLETIVAS EM UMA PERSPECTIVA COMPARADA, São Paulo: RT (2007). Article 87 of the Consumers Defense Code (CDC). Article 6, VII, of the Consumers Defense Code (CDC); Article 8 of the Federal Statute nº 7.347/85. On the Sports Fan Statute, see PEDRO FORTES, The Law related to Brazilian Sports Fans: An Introduction for a British Audience, 11 Entertainment and Sports Law Journal 2 (2013); PEDRO FORTES, War and peace among organized support groups: the challenge of ensuring safety in football stadiums, 22 Caderno FGV Projetos, p. 86 (2013); PEDRO FORTES, We The Fans: Should International Football Have Its Own Constitution?, 21 Southwestern Journal of International Law (2014), p. 63; PEDRO FORTES, Das Brasilianische Sport-Fan Gesetz: eine Einführung für das deutsche Publikum, 32 Mitteilungen der Deutsch-Brasilianischen Juristenvereinigung, v. 1, p. 68 (2014); PEDRO FORTES, A responsabilidade coletiva de torcidas organizadas, 48 Revista do Ministério Público do Estado do Rio de Janeiro, p. 211 (2013). Article 92 of the Consumers Defense Code. Article 100 of the Consumers Defense Code. Article 13 of the Federal Statute nº 7.347/85. One of the blind reviewers suggested that administrative or criminal sanctions could be a better answer for prevention of consumer wrongdoings and criticised the focus of this article on punitive damages. Her commentary gives me the opportunity to clarify that I agree that ‘punitive damages’ are not a silver bullet that would fix entirely a scenario of under-deterrence of consumer protection. On the other hand, the phenomenon of lucrative illegality clearly emerged as a result of this empirical research based on interviews and case analysis. And I owe to many scholars who read and commented this paper – Denis Galligan, Lawrence Friedman, and Alvaro Santos, to name just a few – the recognition that ‘lucrative illegality’ is an original and invaluable contribution to the literature, because it conceptualises neatly a relevant socio-legal phenomenon. DEBORAH HENSLER, NICHOLAS PACE, BONITA DOMBEY-MOORE, BETH GIDDENS, JENNIFER GROSS, ERIK MOLLER, CLASS ACTION DILEMMAS: PURSUING PUBLIC GOALS FOR PRIVATE GAIN, RAND (2000), pages 93-99. Article 1, § 2, of Normative Resolution BACEN n. 3518/07. TEORI ALBINO ZAVASCKI, PROCESSO COLETIVO: TUTELA DE DIREITOS COLETIVOS E TUTELA COLETIVA DE DIREITOS, São Paulo: RT, 4ª edição (2009), pages 40-43. According to Baird, Gertner, and Picker, “we shall assume that a player values a payoff in a future period less than a payoff in the future period. We account for this by introducing a discount factor, the amount by which the value of a payoff in the next period must be adjusted to reflect its value in the present period. If we have a discount factor of δ, the present value of one dollar earned in the subsequent period is δ dollars”. DOUGLAS G. BAIRD, ROBERT H. GERTNER, AND RANDAL C. PICKER, GAME THEORY AND THE LAW, Harvard University Press, 2003, page 168. See, for instance, http://www.procon.sp.gov.br/pdf/acs_ranking_2010.pdf (last checked 04/24/11). I am grateful to an anonymous reviewer who not only praised this article, but also suggested that instead of an imagined hypothetical, I should ground my realistic scenario in empirical data collected through interviews and case analyses. I followed her advice, but – in a conservative fashion – assumed that three pending cases would lead to definitive convictions of companies to pay punitive damages. However, probability of a conviction is almost none and the amount of monetary rewards in the few convictions has been very low. My estimative of 3% for compensatory damages also comes from pending cases in which companies may have to recognise a credit for consumers in their long term contractual relationship. (0.01) x (-13) + (0.03) x (-3) + (0.96) x (7) = – 0.13 – 0.09 + 6.72 = 6.5. JONI HERSCH AND W. KIP VISCUSI, Punitive damages: how juries and judges perform. The Journal of Legal Studies, Vol. 33, N. 1 (January 2004), pages 1-36. CASS SUNSTEIN, REID HASTIE, JOHN W. PAYNE, DAVID A. SCHKADE, and W. KIP VISCUSI, Punitive damages: how juries decide, The University of Chicago Press, Chicago (2002). See also CASS R. SUNSTEIN, DANIEL KAHNEMAN, and DAVID SCHKADE, Assessing punitive damages (with notes on cognition and valuation in law), in Behavioral Law and Economics, Cass R. Sunstein (editor), Cambridge University Press (2000). THEODORE EISENBERG, JEFFREY J. RACHLINSKY, AND MARTIN T. WELLS, Reconciling experimental incoherence with real-world coherence in punitive damages. Stanford Law Review, Vol. 54, n. 6 (Jun-2002), pages 1239-1271. THEODORE EISENBERG, JOHN GOERDT, BRIAN OSTROM, DAVID ROTTMAN, AND MARTIN T. WELLS, The predictability of punitive damages. The Journal of Legal Studies, Vol. 26, N. S2 (June 1997), pages 623-661. In a series of recent decisions, the U.S. Supreme Court has echoed the criticisms of the unpredictability of jury awards and has imposed constitutional limits on punitive damages See, for instance, BMW of North America v. Gore, 517 U.S. (1996); State Farm Mutual Automobile Insurance Co v. Campbell, 538 U.S. 408, 417 (2003); Exxon Shipping Co v. Baker, 554 U.S. 471 (2008). The premise of these judgements consisted of an assumption that excessive economic sanctions were negative for companies, stakeholders and consumers mainly due to their unpredictability. See JEFFREY L. FISHER, The Exxon Valdez case and regularizing punishment. Alaska Law Review, Vol. 26, n. 1, pages 1-46 (2009). A. MITCHELL POLINSKY, Are punitive damages really insignificant, predictable and rational? A comment on Eisenberg et al. The Journal of Legal Studies, Vol. 26 (1997), pages 663-677.